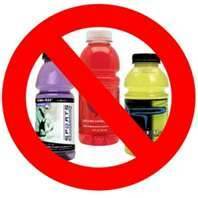 According to the Mayo Clinic, you can also create your own electrolyte drink at home. But the ingredient amounts need to be exact; if they are not, this drink could be harmful. To make your own electrolyte drink, put 1/2 teaspoon salt, 1/2 teaspoon baking soda and 3 tablespoons of sugar in 1 quart of water and mix. By the way, while the stuff ain’t Kool-aid, it’s not as bad as it sounds like it would be either. Keep in mind all the info regarding dehydration before you start dosing your kids with stuff, though.